I got the cat carriers out of the closet this week as a preemptive strategic maneuver against the felines in the household. If the cat carriers are already out, the cats won’t freak out and dash under the bed when I grab their furry behinds to stuff them into the plastic prisons. Bwa, ha, ha! I have opposable thumbs and a cerebrum, which gives me the ability to plan. You are no match for me, kitties! I bet he wouldn’t be napping in there if he knew what was in store for him this week. At least I know he likes his temporary prison! when i moved from arizona back to ny, i brought my two cats with me. and i drove. it was about 4 days. i thought they’d be FREAKING out. i was sure i’d have to endure 4 doays of howling. surprisingly, that was not the case. they just sat in the carrier the whole time. i almost forgot they were there half the time. the harder part was taking them out each night (and finding hotels that allowed pets)…putting out litter and food and water….and then packing it all up again the next morning. I remember having to close all the doors and it being SUCH a project to get the cats into the cat carrier. Holy cow did they hate that. Mine NEVER would have been napping in it like that, no matter how long it stayed upstairs. Hopefully he will like the new home! My little cat always goes right into the carrier as soon as I bring it out. The big cat? Not so much. Actually, they come to adore the carrier after you drive for half an hour. I’m not saying it’s Stockholm Syndrome, I’m just saying they get used to it. my little kitty does this too… silly kitty! The other two – not so much! Love the eyes, looking out on the world from the safety of his cave. Awww, he reminds me of Pepper, the family lab-mix. Since my brother (the ‘official’ owner) refused to have that operation done on his dog, Pepper used to jump the six-foot fence to increase the dog population in our neighborhood. One day the dog catcher saw him, pulled over, and jumped out of her truck leaving the door open. Pepper promptly jumped in the front seat and sat there, tail wagging, eagerly waiting for a ride somewhere fun. 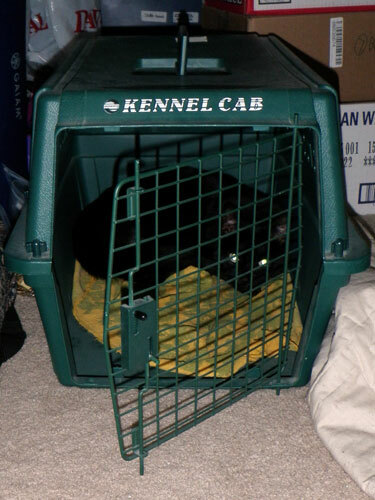 Poor puppy got streetwise real soon — he had to ride in the back in a crate. The dog catcher was laughing as she told me this tale. Pepper, alas, did not see the funny side. The next time she saw him, he streaked back home; she caught him as he was trying to jump back into his yard. Like other posters, we had one cat who absolutely adored the carrier – whenever we couldn’t locate him, we would just go look in the carrier and he would just be cuddled up in it asleep. We do that, too, but our cat doesn’t chill in the cat carrier until after all the vet business is over and we’ve taken her home. She does the cutest thing on long (3-4 hour) car trips: once we’re on the highway, she usually falls asleep, and then an hour or so later she’ll wake up, disoriented, and give a surprised “mrrrow?” which sounds like “Wait, where the hell am I?” We just have to talk to her for a minute and then she’s cool, but it kills me every time. Very cute! Be careful of the heat and don’t allow any possibility of escape. They will get used to the travel. Mine did that questioning meow once, too. I had a cat absolutely shred his claws trying to get out. It was horrible! Diazepam to mellow him out half an hour before. Best of luck on your move.